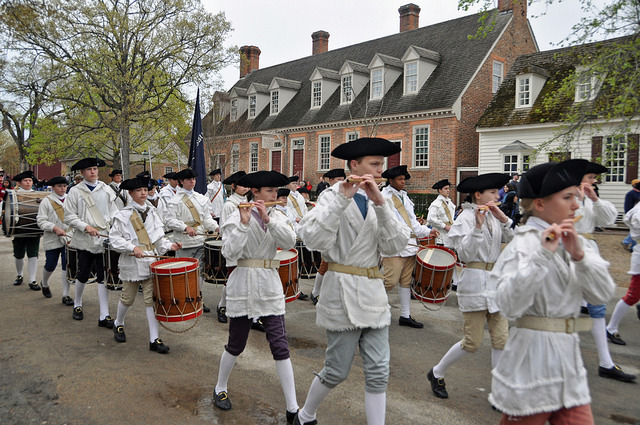 Last week we took our kids to Williamsburg for their shortened (by the snow days) spring break. It was a fun trip overall with a stop at the grandparents and another stop to see Luray Caverns. The caverns were a spectacular sight and we all enjoyed exploring them. Then we ventured to Williamsburg and Jamestown and spent a few days soaking in the history and the culture of those early settlements. It was impressive to hear the reading of the Declaration of Independence and to watch ‘Thomas Jefferson’ speak to the masses about the issues of the time. Everyone was dressed in colonial garb and stayed in character the whole time. The reenactments of battles and regular colonial life were quite a sight as well. It made me proud to see what the founding fathers did and endured to settle this country. However, there was a flip side to that pride as well. As much as the settlers fought for independence, many were hypocrites since they owned slaves. They did not even think of the Blacks wanting freedom or having rights. We saw the living conditions of the slaves on the plantation and it was horrible. There were small overcrowded rooms and little food. The slaves were often tortured and the mortality rates were high. It was a sad sight to see. The other aspect of this trip that brought tears to my eyes was seeing the Native American village and its rich culture and hearing about how these people were either killed or chased away from their lands. It was genocide and awful to think about. We admired how the Natives lived and their symbiotic relationship with nature. They didn’t waste anything and they also were very skilled at making things and growing food. The re-creation of the village and the people dressed as the Native Americans did a really good job of educating us. So, I came out of this adventure back in time feeling mixed emotions about our history. It was nice to see the positive things that helped build this great nation but it was awful to think that enslaving Blacks and killing and stealing from the Natives were all part of that past. I am glad that times have changed and that we are educating our future generations to learn from these mistakes and tragedies. I think the trip made an impact on my boys and it definitely affected me. I think it is a great place for a family trip once the kids can understand a bit of the history. This entry was posted in Parenting, Travel and tagged Historical trip, Jamestown, Kids fun, Spring break, US history, Williamsburg. Bookmark the permalink.